Now Ibanez as a brand is predominantly a guitar manufacturer that has been producing in its current format since 1957. Ibanez was also the first brand to be mass producing the seven string guitar and also the eight string guitar. Ibanez over the years has produced electric guitars, bass guitars, acoustic guitars, amplifiers and effects units but today I’ll be talking about the history of Ibanez in regards to electric guitar making. The Ibanez guitar brand is owned by Hoshino Gakki which runs under the name of Hoshino Musical Instruments or the Hishino Gakki Group in Japan which has a rich diverse history that starts in 1908 in Nagoya with Matsujiro Hoshino founding a book store which included selling sheet music, they started importing music instruments into Japan in these early days before they started manufacturing their own. In these early years the Ibanez brand name was first used by Hoshino after they were importing Salvador Ibanez guitars from Spain for a period from 1929 to sell in their store, after the company they were buying off was sold they decided to manufacture their own Spanish acoustic guitars in 1935 using the Ibanez Salvador brand name for these and then later shortening this down to just Ibanez. Moving towards the end of the 1930’s the company was producing 1000 guitars a month. This massive output of guitar production was scaled back with the war starting and with musical instruments being classed as non essential items. In 1945 the factory burned down, this was due to an air attack and the bombing that occurred in Nagoya during World War 2. Post war when the family returned home they found they had lost everything and so, they started their business again with a new store that was in a shack. During this period of post war business rebuild, the focus became exporting to other countries, namely into America. It was in 1955 that Hoshino Gakki built brand new headquarters in Nagoya Japan and continued with the export only business. It wasn’t until 1957 that the brand Ibanez Guitars that we know and love playing started in earnest. From this time onwards there were many different designs that come through, but it was in the 1960’s that they started to copy the American guitar designs. In 1962 Hoshino Gakki Ten opened the Tama Seisakusho factory for production. By 1966 Hoshino Gakki Ten is starting to use manufacturers outside of their business for supplying guitars and amplifiers, but during this time when they started to outsource they still manufactured drum sets themselves. The Fujigen Gakki guitar factory is used from 1969 to make most of the Ibanez range of guitars and during this time the headstock logo’s are changed from a metal logo to a more modern looking decal logo. By 1971 Hoshino Gakki Ten starts their own USA distribution channel for their musical products which was Elger. In 1975 the Artist range of guitars with their original guitar designs by Hoshino Gakki Ten (Ibanez), Kanda Shokai (Greco) and FujiGen Gakki were launched. Also of note was the introduction of a set neck model in 1975 too. The Ibanez lawsuit period run from 1977 to 1978. This is where the parent company of Gibson filed a lawsuit in the USA against the distributor of the Ibanez range in North America. This was for the copying and the use of the Gibson headstock design and logo. This was settled out of court after a while and I’m sure a few heated discussions and then it was back to business for Ibanez after this. I’m guessing they had already built their branding and name in the market over in the USA by then with their sales and also the publicity of the lawsuit too. During this period of lawsuits Ibanez changed the name of the guitars they were producing and then changed back again after the settlement when they started to produce their own designs. I guess this was the shakeup Ibanez needed to produce their own designs and become a company that sold their guitars based on their own company’s design, technology and manufacture benefits rather than others in the market. 1977 saw Ibanez upgrading and extending their Artist range and introducing a lot of other top notch original designs made to match or surpass famous the American brands they were once copying. There was the Performer and the short lived Concert ranges during this time which competed with the Les Paul. In 1980 the distributor name for the USA changed to Hoshino USA Inc.
Another name change was on the cards in 1981, Hoshino Gakki Ten was changed to Hoshino Gakki and also the manufacturing arm Hoshino Gakki Mfg was started. In the mid 80’s and beyond the interest in instrumental rock guitar was rising and so Ibanez started their collaboration with top level guitarists. This bought players into the fold like Steve Vai, Joe Satriani and Paul Gilbert to name a few and the rest is history in this regard. 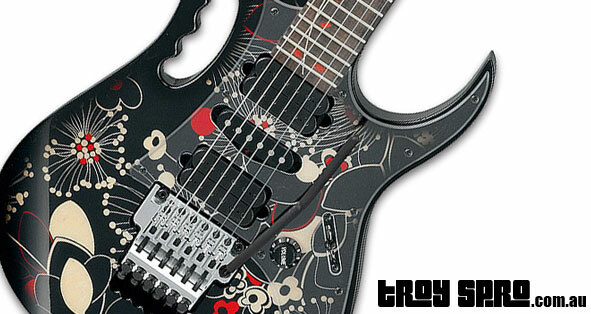 This era saw the release of the Ibanez JEM, JS, RG and S models to name a few. If you have time, read about the Steve Vai and the Ibanez collaboration, how it started and you will have a better regard for Ibanez and also Steve too, it’s a pretty cool story. The Los Angeles office opened for Hoshino Gakki in 1987. Through the late 80’s Hoshino Gakki started to use Korean guitar manufacturers as well as their Japanese guitar manufacturers. After this time they started using Chinese and Indonesian guitar manufacturers as well. Through the 80’s, 90’s and up until now, Ibanez has kept producing musical instruments in large quantities for musicians all over the world. You can see this when you log onto their website and it asks you which country you are in, as you will see, the list is extensive. Also on the Ibanez website there is pretty much every catalogue produced by them from 1960 onwards to have a look at, so you can see the history and evolution of their guitar designs from humble beginnings until now. The Ibanez guitar range comes in Ibanez electric guitar, Ibanez hollow body guitar and the Ibanez acoustic range. The Ibanez electric guitar comes currently in 15 signature models and the guitarists who endorse the Ibanez electric guitars and have their range are some of the world’s top guitar players, some have been with Ibanez guitars for a very long time. There are also 9 series models in the Ibanez electric guitar range, this doesn’t include the left hand Ibanez series models of which you have 3 to choose from. In the Ibanez hollow body guitars, you have 4 signature models and 3 series models to choose from, the guitarists who endorse Ibanez in this category of guitar are great players too, some of these elder statesmen have been busting out licks from well before I was born. Lastly there are the Ibanez acoustic guitar models, there are 2 Ibanez acoustic signature models to choose from and 12 types of Ibanez series acoustic guitars to choose from, this doesn’t include the two acoustic guitar left hand models as well. So as you will see by looking around the Ibanez website they are a big company and continually looking to push the boundaries in design and also with their endorsements too. They have released for production, after showing the prototype at the NAMM show a 9 string electric guitar, now not many companies would do this let alone bring it into production for the masses along with their 7 and 8 string electric guitar models. So if you are looking for a great electric guitar that has a lot of history behind it make sure you have a look at the Ibanez guitar range. To buy Ibanez guitars in Australia there are many online stores (These include music stores that have websites as well as online only music stores) that sell a fair amount of the Ibanez guitar range and some that sell pretty much all of the range of Ibanez guitars, but if you are heading down to your local music shop make sure you check out the Ibanez guitars there if they have a few in stock, have a fiddle and play and decide yourself if you like them. Everyone is different and when it comes to choosing guitars we are all different too, the best way is to try, if you like, buy. I have a couple of Ibanez electrics and I enjoy playing them although I don’t play them as often as I want to these days, but none the less, when I do crack open those clips on the case, pull the pick out of the strings and put it into my mouth, attach the strap, put the guitar on, plug in, flick the amp switch on and hit that first E chord, it’s like nothing else. I hope you have enjoy this brief look into the history of Ibanez and the history of the Ibanez guitar, I’m sure with this company and where it has come from to where it is now there will be a lot more history to write about in the coming decades too, even my kids will be playing and writing about Ibanez guitars.